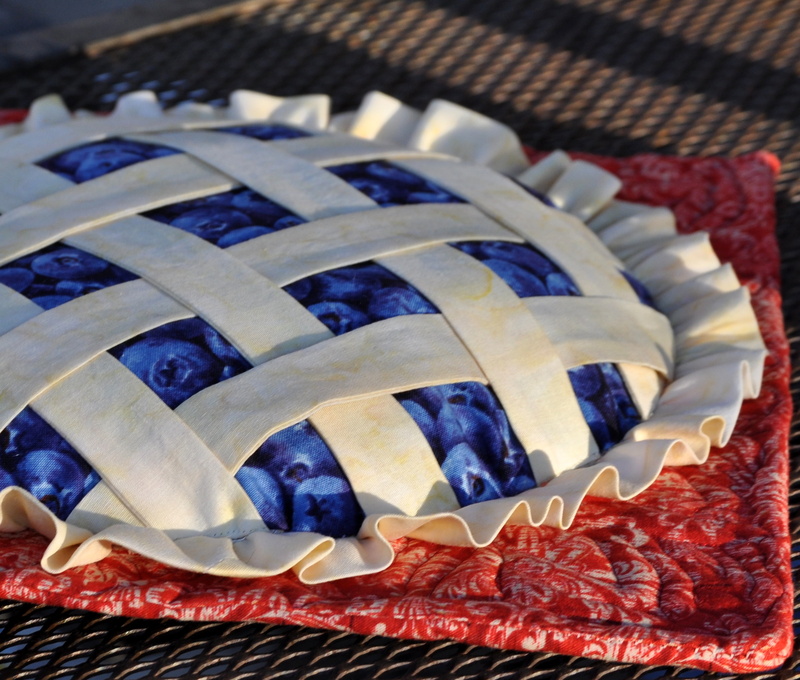 Blueberry Pie, or Is It? Ok, so it’s not real blueberry pie. But it does make you want one. I decided to make a couple of these as I needed a couple of small gifts. 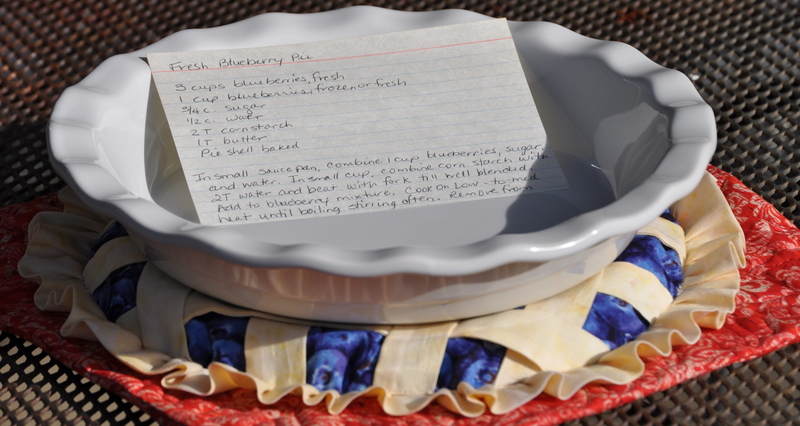 With a nice fluted pie plate and a really good pie recipe, I thought this would make a great wedding, hostess, or housewarming gift. Or heck, even a Christmas gift for that person who likes to cook and has everything already. I found a free pattern at my LQS for this Pie Block Hotpad. The red plate is layered with heat resistant batting and is free motion quilted. The pie is ‘stuffed’ with a little bit of polyfil. And of course, you can pick your own flavor of pie. This is not as ‘quick’ of a project as I was thinking it would be and that could have been for several reasons. 1. Mechanical issues — I do not have a ruffler for my Bernina, so I was trying to ruffle the fabric on the old Singer I have. Let’s just say that after four attempts, it aggravated me to no end so I pulled all of it out and ruffled it by hand. 2. The directions were not as clear in some areas as they could have been. 3. I can be a perfectionist sometimes. I played around with the spacing of the lattice for quite a while before I got it the way I wanted it. The good news is now that I have worked out the kinks, the next one should go along much faster. So that will probably this evening’s project. 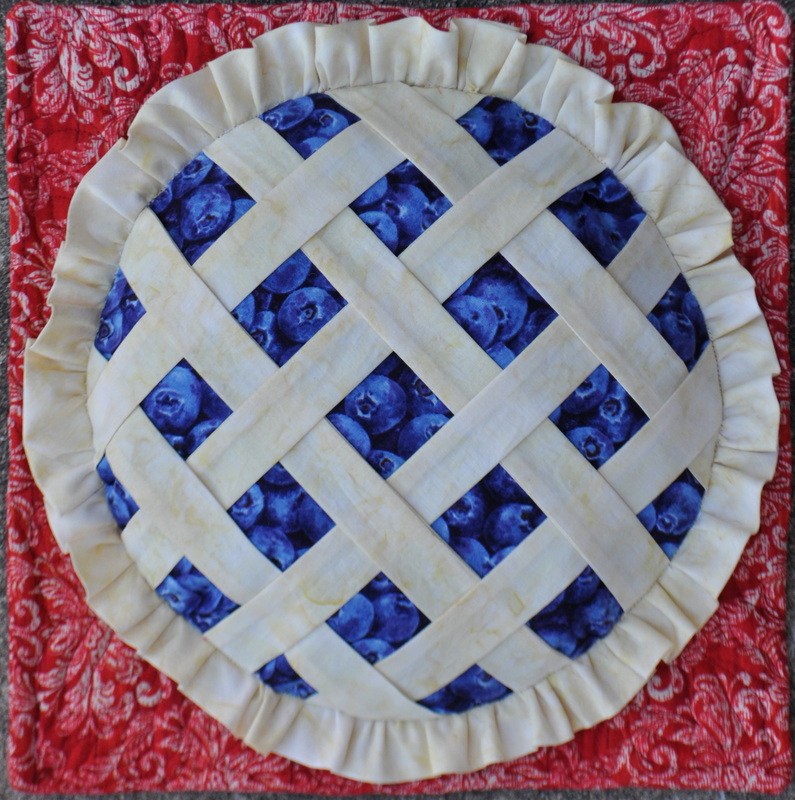 This entry was posted in Quilting/Sewing and tagged blueberry, fmq, free motion, hotpad, lattice, pie, plate, quilting, sewing by monkeyneedle. Bookmark the permalink.